Braille EDGE 40 is not only the most reliable, high-performance refreshable Braille display, it also helps you manage your daily activities. Create and save notes, or read books and documents with the notepad. Use the scheduler to remind you of important dates. Use the alarm to remind you of upcoming appointments, and take advantage of the built-in calculator, stopwatch and countdown timer. 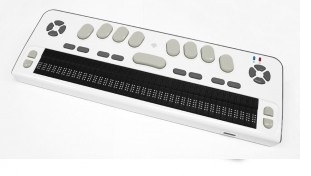 Braille EDGE 40 contains 2 four-way navigation keys and 8 function keys (Escape, Tab, Control, Alt, Shift, Insert, Windows and Applications) combining the convenience of entering text in Braille with the intuitive functionality of a PC keyboard. Braille EDGE 40 offers the convenience and flexibility of multiple languages including English, Spanish, French, German and Italian. Connect Braille EDGE 40 to a computer or PDA via Bluetooth and stay connected throughout the day without the need for charging. For even longer run time, connect via USB and enjoy all the great features of Braille EDGE 40 while simultaneously charging the unit. Read and save your data to the SD card. You can use up to 32GB SDHC cards with Braille EDGE 40, enough to carry thousands of books and documents with you for reading on the go.